I first saw this movie (based on the biography of Jane Austen by Jon Spence) on You Tube. I thought it was okay. On first glance, I enjoyed the music and scenery (actually Ireland, not Hampshire). I saw it again, and was very surprised by the superb acting, especially by the younger actors. 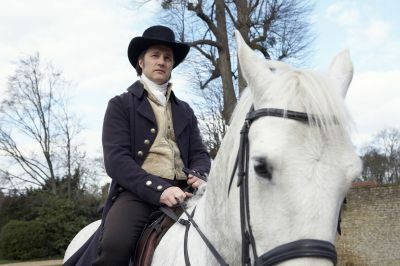 There were a few moments, involving Tom Lefroy’s wild behavior that seemed a bit extreme; aside from that, I have no complaints. This is a beautiful, intelligent movie that I highly recommend to all JA fans! Warning: My review has MAJOR spoilers! 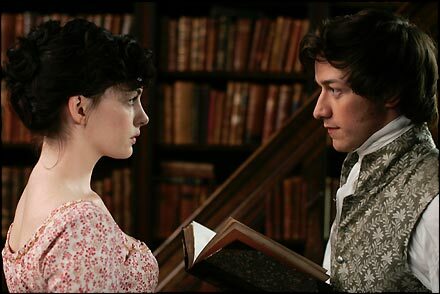 Anne Hathaway plays the 20 year old Jane who, over one tumultuous summer, falls in love with charming lawyer-in-training Tom Lefroy (James McAvoy). 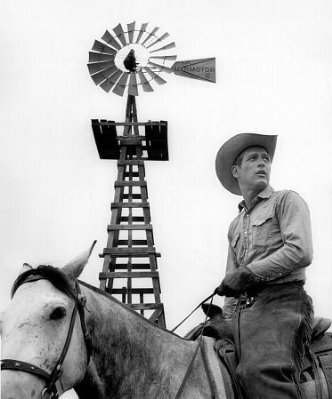 Tom was sent to the country to stay with his cousins by his uncle, a high court judge. This uncle, upon whom Tom relied, disapproved of his wild behavior (gambling, boxing, carousing with women, etc.) Tom is also a great pal of the eldest Austen son, Henry (Joe Anderson, a very cute/blonde young actor). Did you know Anne did her senior thesis at Vassar on JA’s works? She takes her role seriously here. 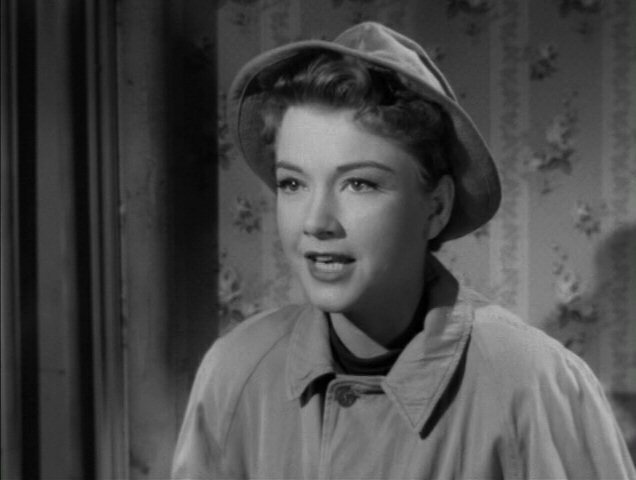 Anne’s take on Jane seems well-researched; she never looks out of place. She learned to write and play paino like JA did! Upon first meeting Tom, Jane is not impressed. In a letter, she calls him “insolent, arrogant, impudent, insufferable, impertinent.” He is bored with this new “rural” set of people, and thinks he’s above them. Shades of Mr. Darcy! The Austen parents, James Cromwell and Julie Walters, are grounded in life’s realities, but they married for love. Father is more sensitive to Jane’s wishes; mother is more of a realist. Another great supporting character is Jane’s beloved older sister Cassandra (Anna Maxwell Martin). She is the shy, sweet, obedient girl in the family. But her fiancé, the young parson-to-be, Mr. Fowl, dies overseas of yellow fever. Cassie, who feels very deeply, never thinks of another man. (This would later become the impetus for Persuasion.) Anna suits her role very well; she had been in many period dramas, including North & South and Bleak House. 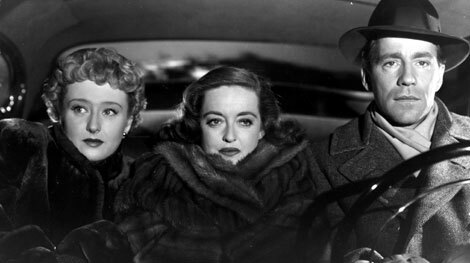 Henry, who also has a sub-plot, is pursued by their elegant, widowed older cousin, a French countess by marriage. 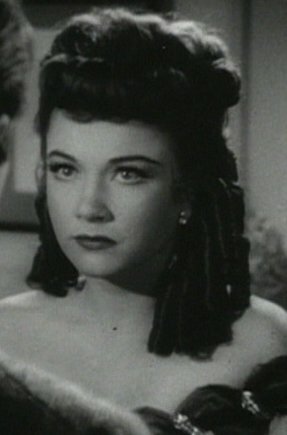 Eliza is the voice of the experienced, worldly woman in Jane’s life. The countess uses her beauty, charm, and (especially) money to gain Henry’s interest. Laurence Fox is the son of actor James Fox and cousin of the lovely Emilia Fox (who appeared as Miss Darcy in the popular Pride & Prejudice miniseries). Laurence recently played Cecil in the new version of A Room With A View. Mr. Wisley slowly grows to admire Jane’s independent spirit. 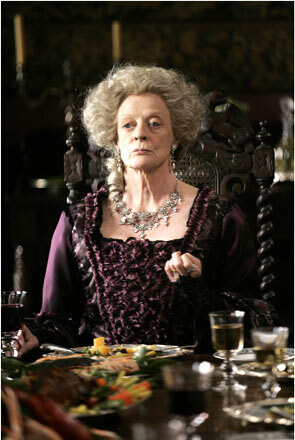 Lady Gresham brings to mind Lady Catherine from P&P, though she is a bit more humane. 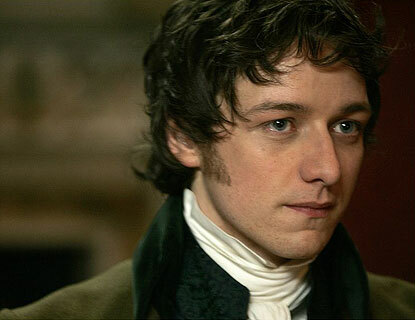 Tom Lefroy was believed to be the one love of Jane’s life. Below is a pic of the real Tom! The young couple are ill-suited for each other, according to the prevailing thought of the day. Though Tom seems like a free-wheeling, carefree guy, Tom is from a poor family in Limerick who depend upon him for support. (His mother married his father for love, and they had many children.) He’s the kind of young man who must marry for money, or wait until he has made some on his own. But, like Jane, he has a non-conformist side. Tom recommends that Jane read Tom Jones to learn more about the world of young men. He never says anything negative about her desire to be a novelist. 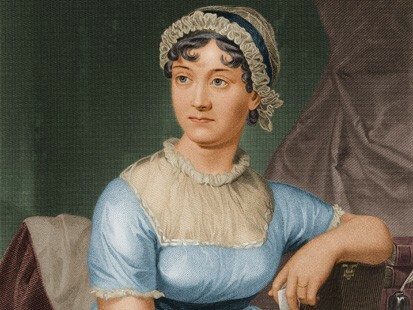 “I think that you, Miss Austen, consider yourself a cut above the company.” -Tom comments during a public assembly (dance). “Me?” -Jane replies with surprise. “You, ma’am. Secretly.” -Tom observes wisely. The main reasons to see this movie: James (and his very fine eyes- a great compliment in JA’s time), the terrific chemistry between him and Anne, and the gorgeous music. James (the more I see of him, the more I want to see!) 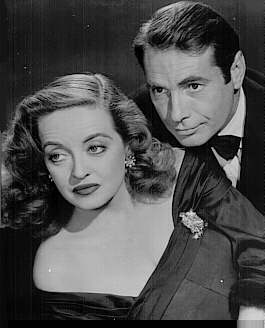 is full of energy, empathy, grace and style in this film. He sinks seamlessly into his character, and these costumes look (especially) good on his frame. He’s one of those (rare) young men who’s not afraid to look vulnerable. His eyes are very expressive. Anne calls him “a legend in the making” on the special features. 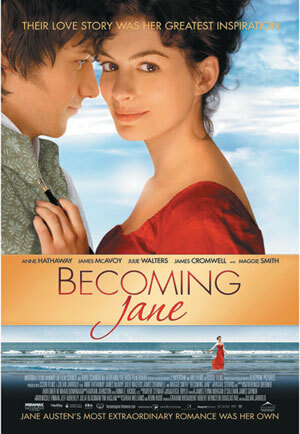 Check out Becoming Jane ASAP! 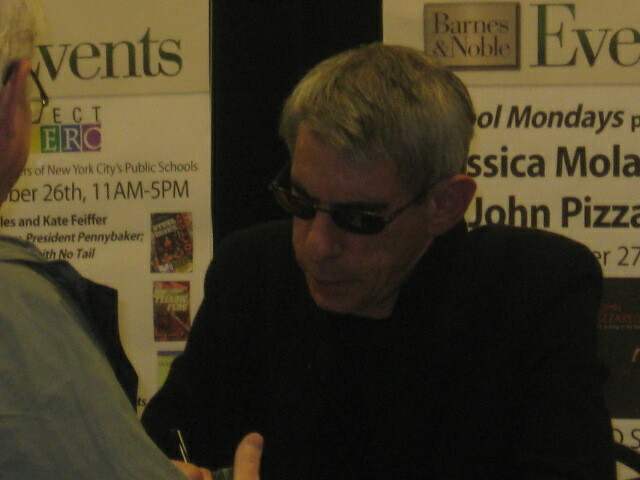 Emma meets Richard Belzer (L&O: SVU’s Det. Munch)!!! 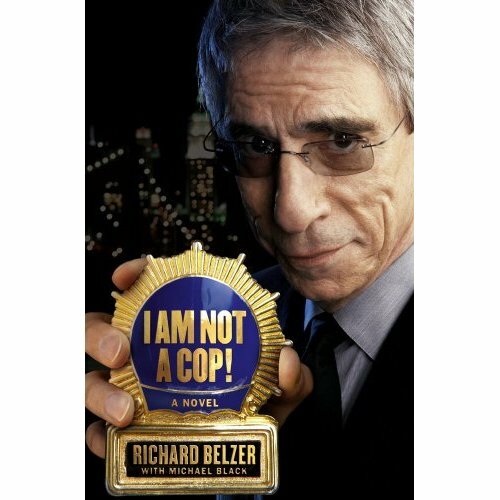 This evening, I went to a book reading/signing at the Barnes & Noble at Lincoln Center (66th St & Broadway) for actor/comedian Richard Belzer’s latest book, a mystery novel that blends real life, fiction, and humor- I Am Not A Cop! Richard was HILARIOUS! He’s very quick with his humor, but also very approacheable. Richard’s glamorous-looking wife (Harlee) and two dogs (Django and Bebe) were also present. (He is the spokesman this year for the North Shore Animal League.) The dogs were walking about the room; people thought that was cute. They were well-behaved (for the most part). 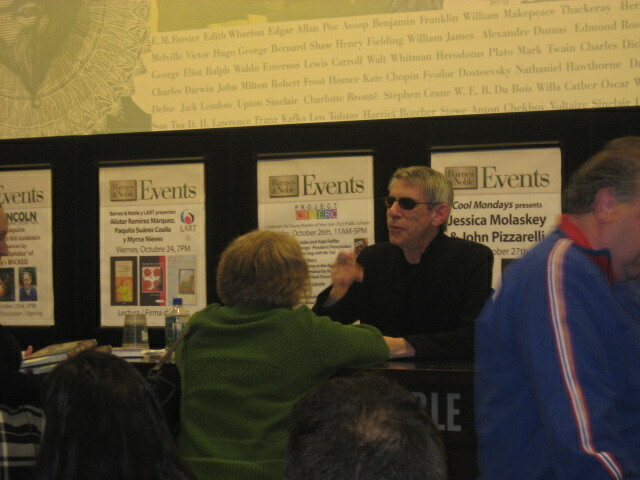 Did you know “the Belz” (as some fans call him) spends his time away from NYC in France? 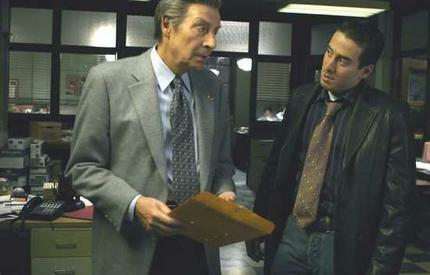 When asked about his great chemistry with Jerry Orbach (they worked together on Homicide: Life on the Street and Law & Order crossover shows), Richard said: “He’s one of the people that I never heard anything bad about. We shared a dressing room whenever we’d do crossover shows. And did you know he was voted as one of the top 100 performers on Broadway? Think of that- out of all the thousands of performers who’ve appeared on Broadway. You know- he was New York.” Very sweet! Richard, unlike Det. 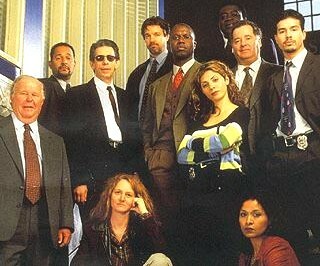 John Munch, has a much more positive tone to his voice. 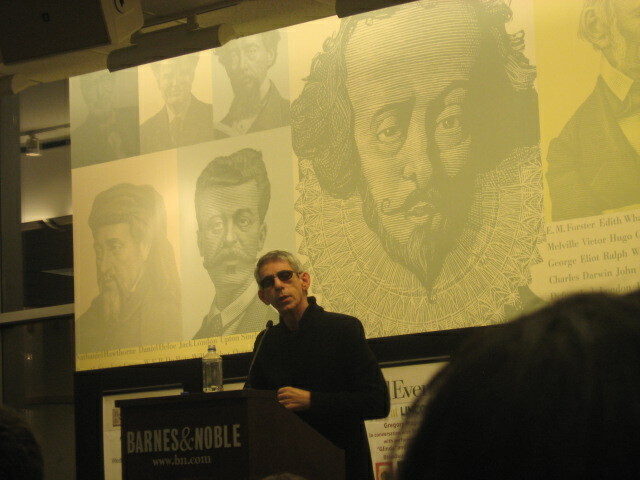 He looked very relaxed, even when an older gentleman made an odd/rambling comment. 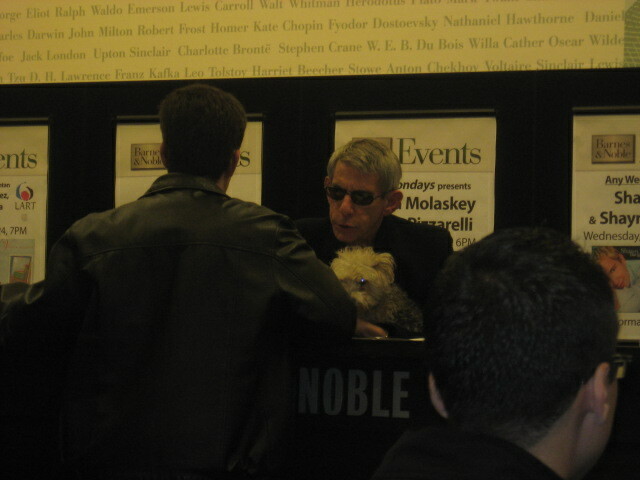 I liked how he related to the audience, and took the time to chat a bit and pose for photos. A few people commented that they wanted to see more of Munch, because he wasn’t very prominent last season. (I agreed!) 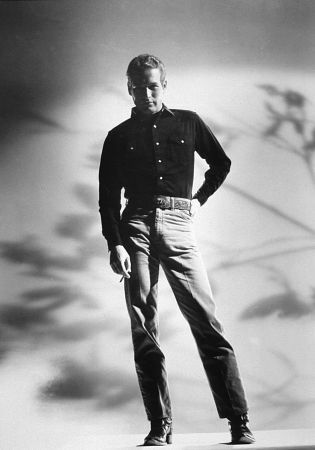 Richard replied that he was “very flattered” but liked to have freedom to do other projects that were of interest to him, too. 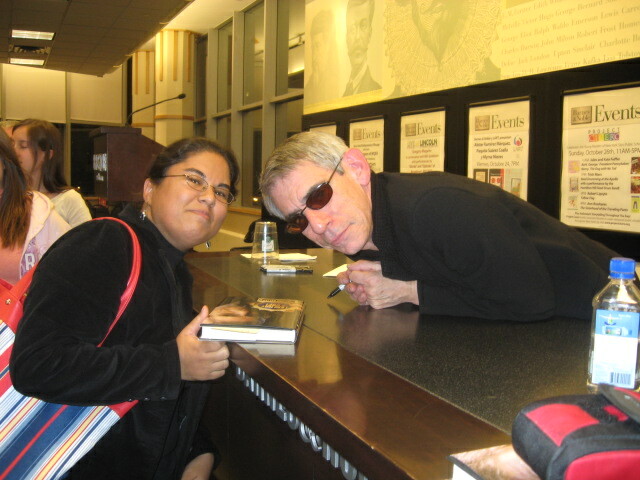 Richard read a few pages from his book; he said he’d been writing for a long time. His plan is to get 2 more novels published soon; one is already completed. 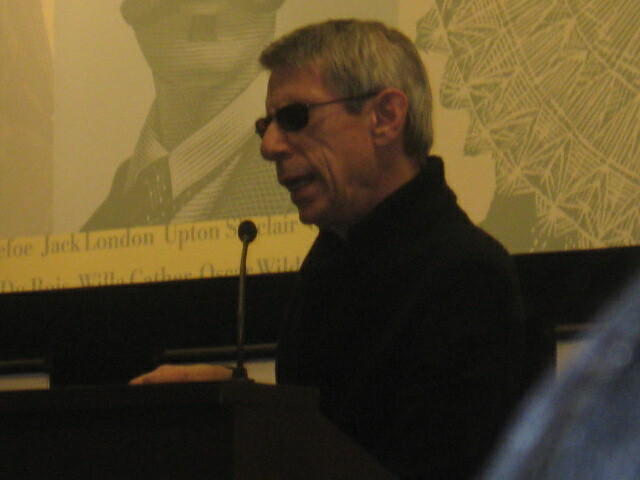 When asked about his motivation/influence, he said he admires (pulp mystery writers) like Dashiell Hammett. Me and Richard- one of the actors I’ve watched for a LONG time!!! I took a pic for the young lady ahead of me in line, so she took one for me- YAY! She looked excited because SVU is her mom’s fave TV show, and she’d be able to give a COOL b-day present. Andre REALLY should be famous! I recommend that you don’t read my review until you’ve seen the movie. But if you don’t mind spoilers, go right ahead. I watched this (three-part) movie again because I was very impressed upon first viewing it on You Tube this past summer. Then I saw it on Masterpiece Theater on PBS. My mom really liked it too, especially the beautiful scenery and music (dramatic when it suited the moment). 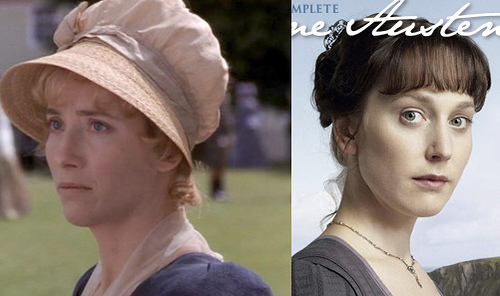 The newest film adaptation of Sense and Sensibility is a mix of Austen and Bronte, according to producer Anne Pivcevic. The Dashwood ladies (middle-aged, widowed mother Mary, sensible/practical eldest daughter Elinor, passionate/opinionated middle daughter Marianne, and energetic pre-teen Margaret) actually live in a cottage very close to the sea in Devonshire. Talk about being removed from “society!” Most of the rain in the movie is real rain. Pivcevic and screenwriter Andrew Davies (who adapted Emma starring Kate Beckinsale and the gorgeous Daniel Deronda among others) explain on the commentary track. The family has fallen very far from the comfort of Norland, the viewer can see clearly. I think it’s best not to hope too fervently for something that may never happen. Aside from the great settings, I was struck my how well the actors (especially those under 30) performed. Janet McTeer (Mrs. Dashwood) is a tall, elegant woman. She brings softness to Mary, who had been a sheltered woman most of her life. Upon her husband’s death, she is a bit lost, and Elinor (just 19 at the start of the tale) has to explain their financial situation to her. 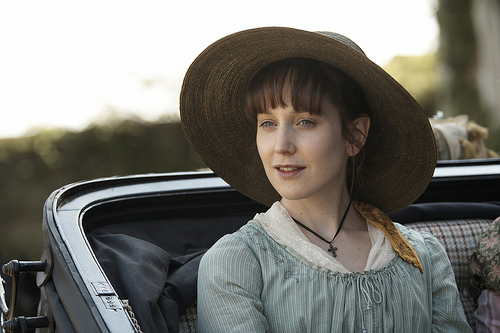 One of my first thoughts was that Hattie Morahan (Elinor) has amazing skin! 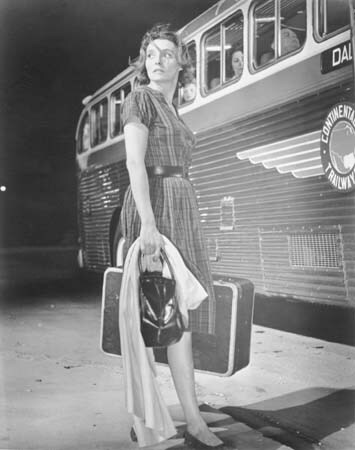 But aside from that, her great posture and fine features seem to suit the time period to a tee. I like her speaking voice; she sounds very elegant (and very similar to Emma Thompson). I always imagined Elinor looking something like this- mature, dignified, and a natural beauty. Just 17 when the story begins, Marianne (Charity Wakefield) is justifiably a little rebellious. She gets upset with Fanny at the dinner table, embarrassed by Sir John and Mrs. Jennings’ jokes, and despairs of ever finding love. Marianne has many different hairstyles to go along with her many moods; this reminded me of modern girls (who often color/re-fashion their hair). The actress’ large blue eyes upon a small face are big assets. As in Ang Lee’s wonderful big screen movie, the young Margaret (here nicknamed Meg) is a bubbly, smart, somewhat tomboyish girl. She is observant, and often says the things that the grown-ups are thinking. You can’t fool kids! Davies says that he worked hard to punch up the male characters; he felt they were underdeveloped in the book (especially Edward). I agree about Edward; in the book, he’s not a captivating guy at all. 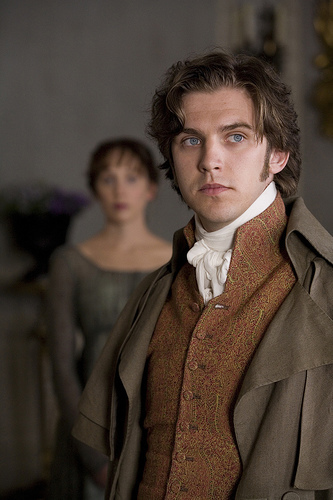 In this movie, Edward Ferrars (Dan Stevens) is the best looking guy! His clothes are a bit old-fashioned and faded, as he doesn’t seek fortune or fame (unlike the rest of his family). Clothes reflect character sometimes, right? 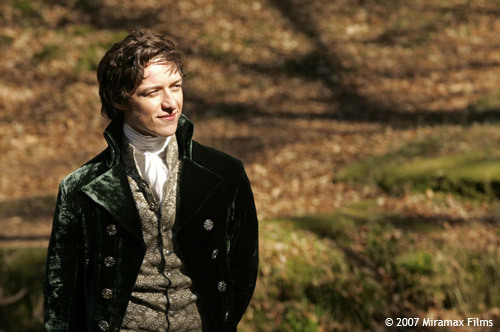 Edward seems shy and awkward, but only briefly; some Austen fans commented that they didn’t like that. This Edward is thoughtful, very honorable (like in the book), but also outgoing. I thought the horse-riding scene with Meg was sweet; that (gorgeous black) horse was Colin Farrell’s in Alexander (Dan Stevens says on the commentary). 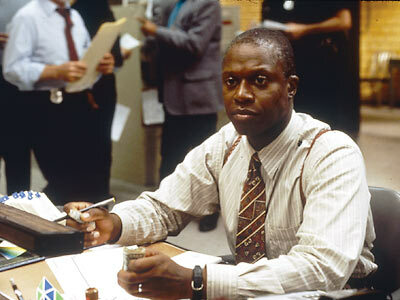 He did a good job with this role; I liked the moments of youthful uncertainty he displayed. The wet shirt/log chopping scene was a too much out of character. However, I did like the sincere concern with which he said “You have very little help here.” That revealed him as a true friend to the family! He is too rational for me- more to be admired than loved. Davies wanted more action for the men, so he expanded on events that were merely hinted at in the book (for example: the duel between Willoughby and Col. Brandon). 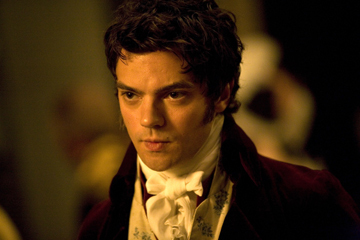 I didn’t think Willoughby (Dominic Cooper, who can currently be seen in The Duchess opposite Keira Knightley) was handsome at all. However, he was very good at playing up the dark undercurrents of his character. 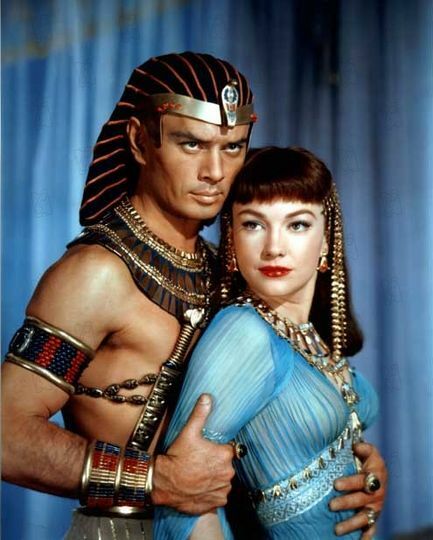 His big dark eyes, dark hair, and richly colored costumes (red, black, elaborately embroidered) helped portray him as someone (potentially) dangerous. Remember that this guy seduced a very young girl (the ward of Col. Brandon) in the start of this version, then abandoned her pregnant. Pivcevic points out that Marianne could also have been ruined by Willoughby because she lets her emotions overtake her judgment at times. Wow, I’d never thought of that! She only lets him have a kiss in this film. Overall, having young actors really paid off! …he’s the only one in the neighborhood one can have an intelligent conversation with! I really enjoyed the parts of Brandon and Marianne becoming acquainted before Willoughby raced in. David Morrissey looks boyish when he smiles; in his eyes, you can see his character’s hopes and fears. After Brandon gives her the sheet music, note the expectation on his face as he mentions her someday trying his piano- good stuff! She says she can talk with him. Marianne wasn’t thinking about love though. Pivcevic says that she needed to grow up more in order to appreciate a good man like the colonel. My favorite moment in the film is at the very end of Part 1. Notice the look on the colonel’s face when he sees Willoughby paying his first call to Marianne (while her ankle is sprained). The concern and sadness in his eyes as he walks away from the cottage reveal much about his character. We can’t help but wonder if Brandon’s just sad for his loss of suit, or if he knows something not-so-nice regarding Willoughby. Another nice moment is when the girls spot Edward (riding quite fast, I thought) toward the cottage; the look of triumphant happiness on Elinor’s face is very sweet. Company, company, company! Where would we be without company? I thought that the smaller characters such as: Fanny, Mrs. Jennings, and Lucy’s hilarious sister (Anne) did a fine job. I loved Anne’s constant chattering about “beaux.” The evil sister-in-law, Fanny, was tightly wound (including her hair), unfeeling, and vain. Mrs. Jennings, besides being quite a busybody, was sweet and solicitous of the Elinor and Marianne (especially in London). Lucy was very naïve about Edward’s family; she is a simple country girl after all. 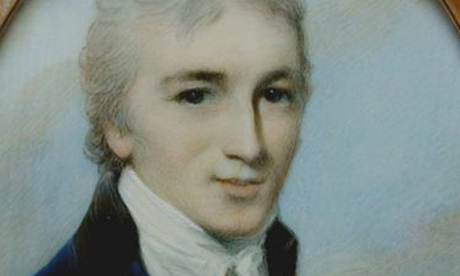 Sir John was too gregarious in the beginning, but he had a twinkle in his eyes that told you he was a decent guy. Austen makes a big point regarding money in her books, and Sense and Sensibility in no exception. The girls deserve much more than what half-brother John offers; Fanny changes his mind (as she wears the pants in that family). 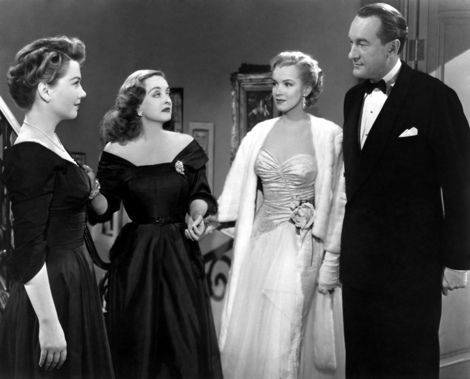 Willoughby, who falls in love with Marianne, chooses Ms. Grey “with her 50,000 pounds” after Lady Allen disowns him. (Lady Allen did so because she found out about his affair with Brandon’s ward, we are told in the Ang Lee version.) He’s used to the good life. Edward, fearing his mother’s wrath and disownment, keeps the engagement to Lucy a secret for 4 years! However, riches are not a big deal for Edward; he wants to become a country parson. One of the main reasons Col. Brandon is seen as very eligible is his great wealth. Oh, we realize that he has great manners, reads, and is knowledgeable about music. But that doesn’t put food on the table! Husbands with good livings (incomes) are very crucial because the girls’ dowries are so small. Elinor is very aware of that fact, though her mother and Marianne choose not to dwell upon it. 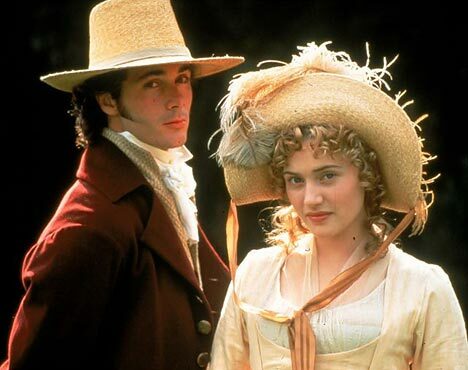 But it all ends well, because respectable, amiable, and pretty girls in Austen’s books get their just rewards! Elinor nearly misses out on a (very compatible) match because she is too reserved- very aware of propriety. When her mother wants to write to Edward, she tells her to “let him come in his own time.” Marianne, on the other hand, risks ruining her reputation by revealing her preference for an (unworthy) man. Notice how she laughs loudly while dancing with Willoughby; she refuses to dance with any other guy at a party. This was not considered good manners in Austen’s time. However, he is her first love, and that’s an age when people aren’t usually sticklers for rules. I thought it was (a little) risky for her to go riding in the curricle for a few hours and visiting Allenham. (I had the same thought when I saw the Ang Lee movie, too.) What do you think? Watch this new S&S adaptation and share your thoughts! 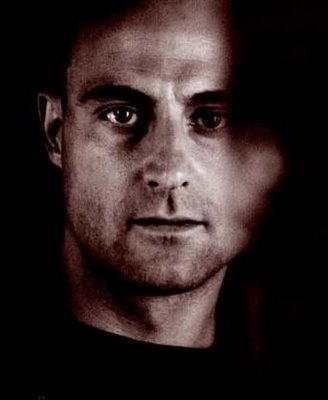 Mark Strong (“my Mr. Knightley”) gets critical acclaim! 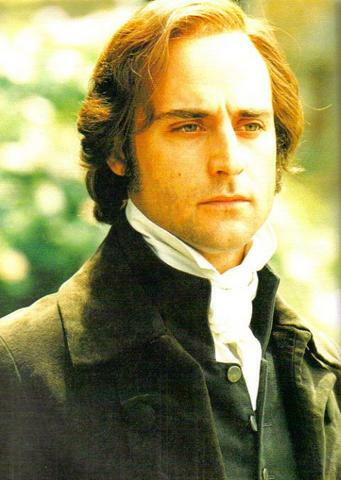 Mark Strong, a VERY talented British actor, played Mr. Knightley alongside Kate Beckinsale in my favorite movie version of Jane Auten’s Emma. I felt that his characterization of Mr. Knightley was close to the book; he was tough (lectured Emma loudly), haughty (knew his position in society), and rooted in the mores of the period. 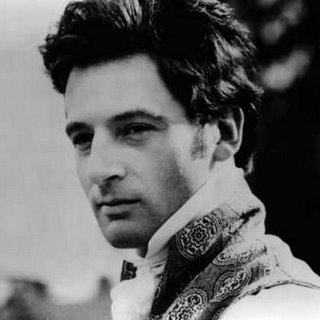 Don’t get me wrong- I LOVE Jeremy Northam’s work, but he made the character more light-hearted and fun in Emma with Paltrow. 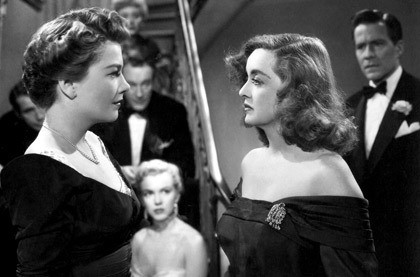 Even the way Northam moved was easy; Strong made Knightley darker, moodier, and more of a mystery. In that same issue of Time, there is a review of the spy thriller Body of Lies starring Crowe and DiCaprio. Mark Strong has a crucial role in that film; he plays Hani Salaam, the chief of Jordanian intelligence (who helps out Leo’s character). Okay, Mark is definitely NOT Middle Eastern, but his looks could be considered “exotic” in Hollywood. His parents immigrated from Italy before he was born; they chose to give him a British name (because they felt it’d help him fit in). 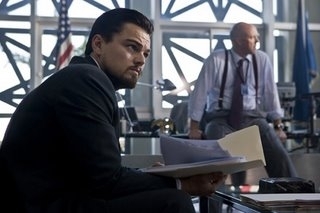 DiCaprio has some unusual-looking facial hair in this film! A reviewer thought it was “squiggly” and “distracting”- LOL! 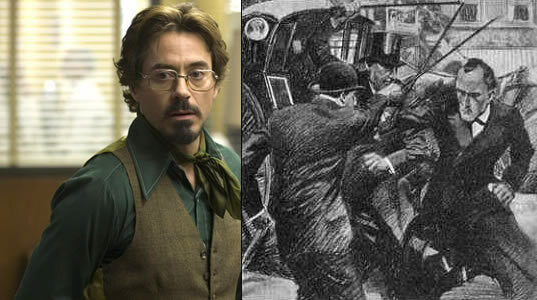 Next up for “my Mr. Knightley”- Sherlock Holmes with Robert Downey Jr. (Holmes) and Jude Law (Watson). 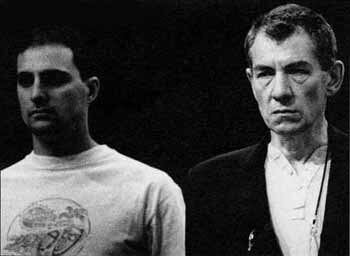 But the coolest of all- Mark has acted alongside Sir Ian McKellan! Below is a pic from a theater production of Richard III.